Thursday, May 6 to Saturday, May 8. The Elora Centre for the Arts thanks you for making our fundraiser outstanding! We are pleased to announce that artcetera 2010 raised almost $30 000! 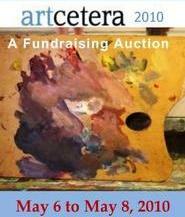 Artcetera 2010 is the Centre’s annual fundraising auction. Local, regional and national artist’s work will be profiled and available for sale through a Silent Auction bidding process over 3 days, culminating in a Live Auction and Reception on the final evening. We anticipate over 300 original works of art and many products and services in the Silent Auction as well as 50 + outstanding pieces of artwork in the Live Auction. Net proceed from artcetera 2010 will benefit programming at the Elora Centre for the Arts. Check out our online catalogues for a sampling of our over three hundred auction items. There will be many more in our historic galleries! Preview the Live Auction here. Preview the Silent Auction here. Enjoy a rare opportunity to bid on art from some of the most notable and unique artists work across Canada. Place your silent auction bids and join in the Saturday Evening Event. Fabulous fare will include fine wines and sumptuous local treats. Bring along your friends and your family to support this community event – Art Matters. Submissions are being taken in two ways: digitally or in person. If you choose to submit in person, please bring the work(s) to the Elora Centre For the Arts prior to March 27th 2011, along with the completed submission form below. Please contact the office by email or telephone if you wish to make a submission through a different method. What to submit: Our goal is to sell each and every piece that is auctioned. Even though, as a rule of thumb, larger pieces are less appealing than smaller ones and a good quality and attractive frame is often a determining factor in a buyer’s purchasing decision at these kinds of events, we encourage you to submit any artwork of your choosing. The more accurately you pinpoint bidders’ tastes and budgets with your submission, the better the chances that it attracts attention and sells for a good price. You are encouraged to submit multiple works. Selection Criteria: artcetera 2011 entries will be selected on an ongoing basis until March 27, 2011 by a jury of professional peers to ensure a high quality presentation of unique and original material. We strive to offer a balance of art forms. The jury will determine whether your submission is to be included in the Live or Silent Auction. All decisions of the jury are final. Pricing: Artists may set the reserve bid on thier own work. artcetera is the Elora Centre for the Arts’ biggest fundraising event of the year, so we earn revenue from this event by each artist donating 50% of the sale price to the Centre. You will be paid 50% of the selling price and receive a charitable tax receipt for the difference between that amount and the suggested retail price. If you are so inclined, we would be pleased to accept the artwork as a 100% donation for which a charitable tax receipt for its full retail value will be issued to you. Whether you donate 50% or 100%, in either case we are most grateful to you for your gift, and you will be provided with a charitable tax receipt. We would like to emphasize that all artists have the oppertunity of profiting from their donated work, from both the auction sale and from repeated and broad exposure at the auction, in our online catalogue, and via local press.